Help position feet and hold in place. 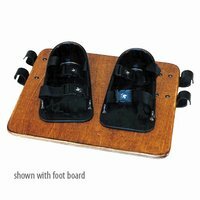 Mount to footplate or optional foot board. *Item is for the Shoe Holders ONLY, Does NOT include foot board. Sold in pairs. You can earn 100 Ocelco Cash Reward Points on this product!